A medical technologist is a highly skilled health professional who tests and analyzes blood, body fluids, and tissue samples. Technologists are responsible for operating and maintaining the equipment used to analyze the specimens and ensuring that tests are completed in an accurate and timely manner. Medical technologists typically hold a bachelor's degree and have undergone an internship in a pathology lab. Their training is more extensive than that of a medical lab technician with whom they often work. Although medical technologists do not often interact directly with patients, their work is vital to the appropriate diagnosis, treatment, and care of patients. Medical technologists work in all areas of the lab, including immunology, microbiology, genetics, histology, hematology, chemistry, toxicology, and blood banking. Their role is purely diagnostic and limited only by the tools they are provided. The role of a medical technologist may also be determined by the branch of pathology the lab specializes in. The combined branches of clinical and anatomical pathology are referred to as general pathology. Medical technologists typically work under a pathologist but may be independently tasked to operate the lab itself. Among their duties, medical technologists will oversee the work of lab technicians in addition to managing their own duties. In larger facilities, technologists will perform more exacting tasks, such as molecular, genetic, or genomic testing. They will also step in when confronted with diagnostic challenges, including uncommon or contradictory lab findings. Medical technologists are also responsible for preparing tissue samples, slides, and cultures for the pathologist to examine, streamlining the diagnostic process and allowing for faster lab results. The training that medical technologists undergo provides them the insights needed to know which testing methodologies, tools, and agents are most appropriate for each case. Although the pathologist is ultimately in charge of the lab and its staff, the medical technologist will usually be the one who ensures that the lab operates smoothly, safely, and accurately on a day-to-day basis. This includes setting up, calibrating, and sterilizing lab equipment as well as analyzing and checking the accuracy of lab reports. Certain medical technologists will work in a narrow field of practice. For instance, some labs may specialize in genetics or cytopathology only. Others may have specific roles and functions within a hospital or institutional setting. A technologist working in transfusion medicine would ensure that there is an adequate and safe supply of blood in a blood bank. Other tasks may include blood typing and screening the blood for infectious diseases (such as HIV and viral hepatitis). Forensic pathology involves the examination of clinical and anatomical evidence after a sudden, unexpected death. While the forensic pathologist would typically be responsible for obtaining the human and non-human specimens (such as clothing fibers), the medical technologist would run many of the tests needed to determine the cause of death. A medical technologist career requires at least a bachelor’s degree, preferably in an applicable scientific field such as biology, microbiology, or biochemistry. The completion of a medical technologist program accredited by the National Accrediting Agency of Clinical Laboratory Science (NAA-CLS) is also required. In addition to the traditional university pathway, hospital-based courses are sometimes offered to students during their senior year of college. These are designed for students who majored in another science program (or obtained a degree in another science program) but have decided to become a medical technologist. Students will begin the application process for their internship taken during their senior year of college. By the fall, students will know whether or not they have been accepted for an internship. For optimum success, medical technologists should become certified after completing all of their educational and training requirements. The American Society of Clinical Pathologists (ASCP) offers a national certification exam that should ideally be renewed every three years. This certifies that you are proficient in your field and allows you to add the initials MT(ASCP) after your name. Certain states require licensing for all medical lab personnel, while others do not. Because the requirements can vary by state, contact your local state board or Department of Health for details. Most medical technologists operate behind the scenes and do not have direct contact with patients. The health professionals generally tasked with obtaining specimens are phlebotomists and lab assistants. Other specimens are delivered directly to the lab by doctors and surgeons. Medical technologists are in extremely high demand, according to the ASCP. 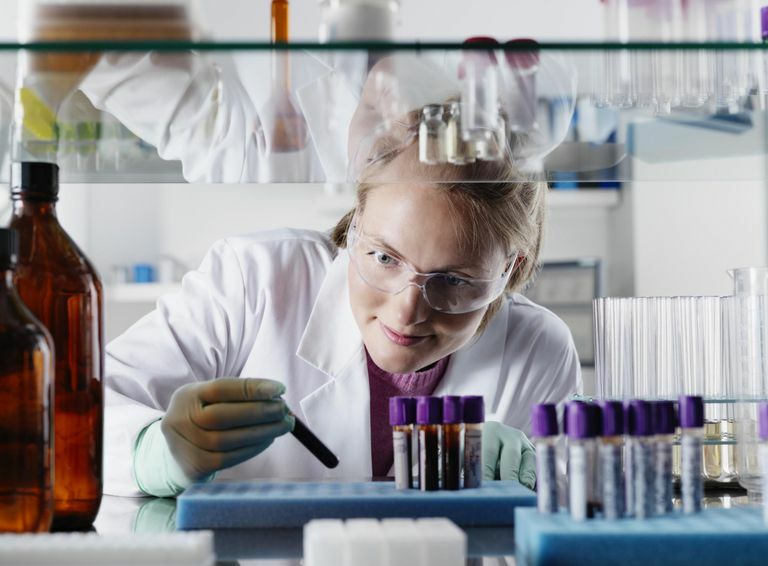 While there is a shortage in all medical lab career fields, medical technologists have the highest vacancy rate of all, at an estimated 10.4 percent. According to a May 2016 report from the Bureau of Labor Statistics, the median annual salary for medical technologists in the United States is $62,440. The top 10 percent of earners have a yearly income of $85,190. If you are seeking a similar career that does not require a bachelor’s degree, you may want to consider a career as a medical laboratory technician. Bureau of Labor Statistics. Occupational and Employment Statistics - Occupational Employment and Wages, May 2016: 29-2011 Medical and Clinical Laboratory Technologists. Washington, D.C.: U.S. Department of Labor; updated March 31, 2017. Garcia, E.; Kundu, I.; and Fong, K. The American Society for Clinical Pathology’s 2017 Wage Survey of Medical Laboratories in the United States. Amer J Clin Pathol. 2019 Jan:151(1):29-52. DOI:10.1093/ajcp/aqy139.